The Tournament is back, held regularly since 1880, it had been cancelled since 1999 due to budget cuts. It's back with a bang for the 21st century, and includes calvary charges, marching bands and even a recreated battle in Afghanistan by soldiers recently returned from the war. The event will include the Royal Navy Field Gun Trials, an event that simulates events from the Boer War. Also, there will be plenty of martial music to enjoy, from the Musical Ride of the Household Cavalry to the Musical Drive of the King's Troop. The event is sponsored by Boeing and Aegis, and supports the Soldier's Charity, an invaluable aid to the Soldiers and Sailors of the Crown. 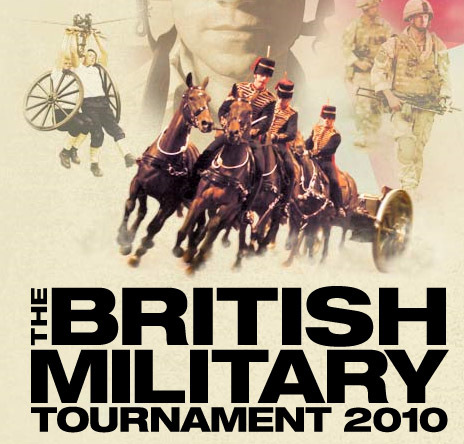 The Tournament will be held at Earls Court Stadium in London on December 4th and 5th, 2010. The show is not recommended for babes in arms.